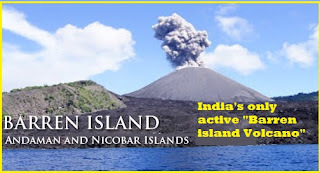 India's only active "Barren island Volcano" in the Andaman and Nicobar Islands has started spewing smoke and lava again. 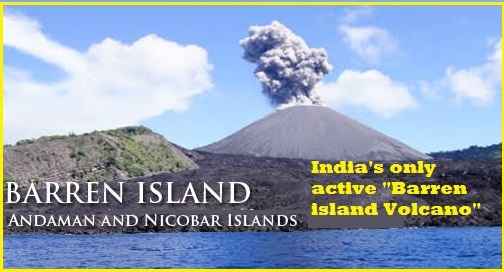 The Barren Island volcano, located about 140 km northeast of Port Blair, started erupting in 1991 after a dormant phase of over 150 years and has shown intermittent activity since then. After lying dormant for 150 years, Barren Island volcano erupted in 1991 and has been showing sporadic activity since then, scientists of Goabased National Institute of Oceanography (NIO) said. Researchers from Council of Scientific & Industrial Research (CSIR) and NIO have sampled sediments and water in the vicinity and recovered coal-like black pyroclastic material representing proximal volcanic ejecta. These samples will help in deciphering the nature of present and past volcanic activity in the region. The National Pharmaceuticals Pricing Authority (NPPA) has asked manufacturers and importers of coronary stents to submit details, including price list of their products, before first of next month. In a notification, the drug pricing regulator also asked the manufacturers to furnish quarterly returns of production, import and sale of coronary stents. The NPPA said, manufacturers will issue the price list to it online and submit a copy to all state drug regulators and distributors, dealers and retailers. It also said, if the requisite information is not submitted within the prescribed date necessary action will be initiated. Providing relief to cardiac patients, NPPA cut prices of life-saving coronary stents by up to 85 per cent by capping them at 7,260 rupees for bare metal and 29,600 rupees for drug eluting variety. Tamil Nadu New Chief Minister "Edappadi K Palaniswamy Wins Trust Vote"
In Tamil Nadu, the new Chief Minister Edappadi K Palaniswamy won the trust vote by a slender margin that was held after eviction of opposition DMK MLAs and walk out by the Congress. In the voting, M Palaniswamy's confidence motion got 122 votes in favour and 11 against. An AIADMK member did not participate in the voting. Mr Palaniswamy hails it as an endorsement of the House for his Government to continue. However, Opposition parties have dubbed the trust vote as a farce. The Indian Navy’s second ocean going sailboat Tarini was inducted, in presence of host of dignitaries at a glittering ceremony at INS Mandovi Boat Pool. Admiral Sunil Lanba, Chief of Naval Staff along with other senior Naval Officers was also present on this historic occasion to wish the boat and her crew success in their endeavors. About INSV Tarini: INSV Tarini is a sloop built by M/s Aquarius Shipyard Pvt Ltd at Divar, Goa. The sail boat Tarini is being inducted into the Navy and is slated to be the platform for "First Indian All Women Circumnavigation of the Globe expedition of the Indian Navy". Indian Navy will is operating four sailing vessels capable of open ocean deployments, that is, Tarangini, Sudarshini, Mhadei and Tarini, all four of which have been built in shipyards at Goa. Indian Navy is attempting to revitalise open ocean sailing and will also be inducting four 40 feet, state of the art open ocean racing sail boats. Union Minister of Agriculture and Farmers Welfare, Shri Radha Mohan Singh inaugurated (19.02.2017) India’s Western Regional Agriculture Fair 2017 in Bikaner, Rajastan. On this occasion, Minister of Agriculture briefed that total milk production during 2015-16 was 52.21 million ton which increased to 54.50 million ton in 2016-17. An increase of 4.38% has been recorded in the area of milk production. During 2015-16 the total production of eggs was 27.33 billion which increased up to 29.09 billion during 2016-17. An increase of 6.42% has been recorded in eggs production. During 2015-16, the production of meat was 2.24 million ton which enhanced to 2.23 million ton in 2016-17. An increase of 8.74% has been recorded in meat production. The Union Cabinet chaired by the Prime Minister Shri Narendra Modi has approved the signing of Air Services Agreement between India and Rwanda. The Agreement has the potential to spur greater trade, investment, tourism and cultural exchange between India and Rwanda, bringing it in tune with developments in the civil aviation sector. It will provide enabling environment for enhanced and seamless connectivity while providing commercial opportunities to the carriers of both the sides ensuring greater safety and security. India Women Team Wins Silver Medal in "Asian Women's Rugby Sevens Trophy 2017"
The Indian Women's team (19.02.2017) won a silver at the Asian Rugby Sevens Trophy tournament at Vientiane, Laos. A total of seven countries from across Asia including South Korea, Philippines, Malaysia, Nepal, Pakistan, India and hosts Laos vied for top honours in the tournament. All the seven teams played on a Round Robin basis. On Day one, India defeated Lao by 22-7, Philippines by 12-5, Nepal by 43-0 and Malaysia by 26-12. On Day two, India defeated Pakistan by 5-0 and in the last match India was beaten by South Korea by 29-0. Sandeep Kumar of Haryana won the gruelling men's 50 kilometre event of the National Race Walking Championships in New Delhi (19.02.2017). Sandeep smashed his own national record, clocking three hours, 55 minutes and 59.05 seconds. With his brilliannt performance, he also qualified for London World Championships in August. His earlier national record was 3 hour, 56 minutes and 22 seconds, which he clocked in the IAAF World Race Walking Cup at Taicang, China in May 2014. Dronavalli Harika and Padmini Rout creates Records in "World Women's Chess Championship, Tehran 2017"
Grandmaster Dronavalli Harika and International Master Padmini Rout created history by winning the tiebreaks of the second round of World Women's Chess Championship in Tehran (18.02.2017). Both the Indians have now advanced to the last-16 stage of the championship. In the next round, Harika will take on Sopiko Guramishvili of Georgia, while Padmini will meet another Chinese Tan Zhongyi. India's star shuttler PV Sindhu has risen to a career best BWF ranking of number five. She overtook Japan’s Akane Yamaguchi, as per the latest rankings released on 15.02.2017. This is the first time that Sindhu has broken into the top five. Saina Nehwal, who is ranked ninth, is the other Indian in the top 10, while Chinese Taipei's Tai Tzu Ying continues to lead the rankings. Saina had a rather forgettable year in 2016 as she had been out for most of the year due to a knee injury. Sindhu, in contrast, had probably the best year of her career as she won the Silver Medal at the Rio Olympics and became the first Indian woman to win an Olympic silver medal. California gets hit by strongest storms in years dubbed "weather bomb"; kills at least four people and bringing torrential rain and floods; Power cuts hit 150,000 households; storm disrupts more than 300 flights. One of California's strongest storms in years - dubbed as "bombogenesis" or "weather bomb" - has hit the state, killing at least four people and bringing torrential rain and floods. Power cuts hit 150,000 households and sinkholes swallowed cars. Hundreds of homes were evacuated amid fear of mud slides near Los Angeles. More gusts, heavy rain and flash floods were expected on Saturday but the storm is due to subside on 12.02.2017. More than 300 flights have been disrupted at Los Angeles International Airport, and major roads have closed. One man was killed after a tree fell and pulled a power line on to his car in the Sherman Oaks area of Los Angeles.